The cancer stem-like cells (CSLCs) are tumorigenic cells promoting initiation, progression, and spread of the tumor. Accumulating evidences suggested the presence of CSLCs in distinct tumors including laryngeal squamous cell carcinoma (LSCC). MicroRNAs have been proposed as significant regulators of carcinogenesis, and several of them have been demonstrated to have direct roles in survival of CSLCs. In this study, we aimed to explore the role of miR-145, which is downregulated in LSCC, on cancer stem cell potency of laryngeal cancer cells. We initially showed the downregulation of miR-145 expression in tumor tissue samples and in CD133-enriched CSLCs. Quantitative reverse-transcription PCR (qRT-PCR) analysis of miR-145-transfected Hep-2 cells demonstrated the inhibitory role of miR-145 on stem cell markers like SOX2, OCT4, KLF4, and ABCG2. We, then, investigated the stem cell features of miR-145-overexpressing Hep-2 cells by sphere formation assay, single-cell cloning assay, and aldehyde dehydrogenase (ALDH) assay, which all demonstrated the inhibition of stem cell potency upon miR-145 overexpression. Further qRT-PCR analysis demonstrated altered expression of epithelial to mesenchymal transition markers in miR-145-overexpressing Hep-2 cells. In conclusion, we demonstrated the regulatory role of miR-145 in stem cell characteristics of Hep-2 cells. 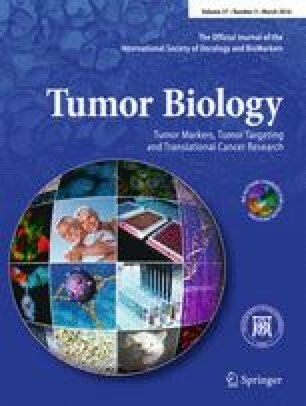 Based on these results, we propose that miR-145 might carry crucial roles in LSCC tumorigenesis, prognosis, metastasis, chemoresistance, and recurrence through regulating stem cell properties of tumor cells. The online version of this article (doi: 10.1007/s13277-015-4219-z) contains supplementary material, which is available to authorized users. We thank Yiqun Zhang for technical assistance in microarray analysis. The studies presented in this manuscript were partially supported by The Scientific and Technological Research Council of Turkey (TUBITAK, grant number 210T009) and by the US National Cancer Institute grant P30CA125123. This study has been reviewed and approved by an institutional review board of Istanbul University, Cerrahpasa Medical School (IRB No. 35697). Patients were included into the study after each of them signed written informed consent forms.